vacancies in Karnataka Municipal Administration Recruitment are 14 posts. Candidate must have Age limit between 18 years to 35 years. Maximum age limit for 2A, 2B, 3A, 3B candidates 38 years and for SC/ ST candidates is 40 years. Pay scale for Stenographer Jobs is Rs. 14550/- to Rs. 26,700/-. Application fee for general/ OBC candidates is Rs. 500/- and for SC/ ST candidates is Rs. 250/-. Selection of candidates for Stenographer vacancies is based on Typing Test/ Shorthand Test. Eligible/ willing candidates may visit the official website www.municipaladmn.gov.in. Open the Karnataka Municipal admn website and apply for Stenographer vacancies. Closing date for submission of application form through offline is 18th December-2017. 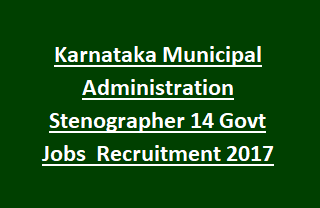 For more details of Selection Process, Application Procedure, Age limit, Application Fee, Educational Qualification details regarding Karnataka Municipal Administration Recruitment of 14 Stenographer vacancies notification are given below.